Do you need to find a particular email from someone? Or maybe you want to organize your email messages into other folders? You can sort your email so the most recent messages appear at the top (or bottom) of the list, making it easy for you to find what you're looking for. 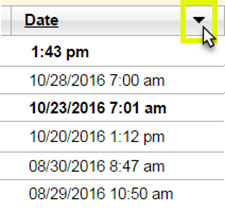 In the Date column, click the down arrow to sort email messages by the date. Email will initially appear with the most recently received (or sent) at the top. To view your older messages at the top of the list, click the (now turned) up arrow .